This authentic Rock'n Roll / Rockabilly DJ keeps your party guests dancing all night long! If you're planning a special kind of 'Rock'n Roll' themed party, special anniversary, wedding or any other type of event, then DJ Spinround is exactly what your looking for! He's a truly authentic Rock'n Roller and has been spinning the turntables since 1999, He'll get the party started and keep your guests movin' all night long with his original collection of 45's from those unforgettable 50's and 60's. 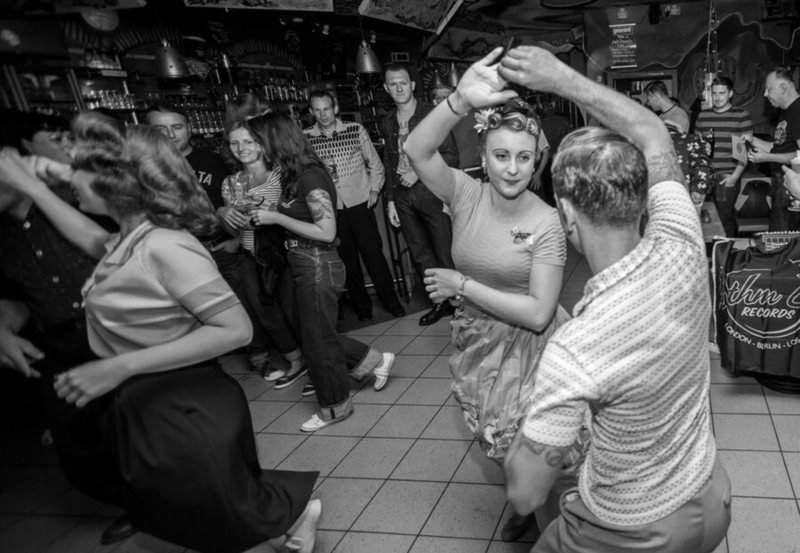 Rockabilly, Rhythm & Blues, Doo Wop, Country, Boogie Woogie, Swing & Pop from the 50s and early 60s. DJ SpinRound brings all this along in his vintage record case, offering you the very best and most fabulous music to jive, stroll, boogie-woogie & rock & roll. He is also one of the rare and true 'Elvis Vinyl DJs' - playing the coolest and best dance songs that Elvis has to offer from the 50s to 70s. Also available with his authentic Rock'n Roll Band Chris Aron & The Croakers.